foot postures in climbing, perching, and ground-dwelling birds (Feduccia, 1993). Quantitative studies have also revealed an intraspecific trend of increasing variation from the proximal to distal elements of bird and bat wings (Bader and Hall, 1960; Engels, 1938). Vertebrate limbs consist of hierarchical structural units, undergo temporal transformations in form, and exhibit varying degrees of connectivity with other modules (Raff, 1996). Limbs are therefore important units, or fields, of ontogenetic and phylogenetic change (Gilbert et al., 1996). Recent studies of limb development provide new support for Hinchliffe's model of proximal stabilization and distal variability in limb evolution. These include evidence that the autopodium is developmentally autonomous from the proximal limb, involving different molecular pathways during chondrogenesis and a distinctive third phase of HoxD gene expression regulated by a single "global" enhancer (Chiu and Hamrick, 2002; Hérault et al., 1998). Loss-of-function mutations also reveal that redundancy exists among many of the patterning genes expressed during limb development so that knockout mutants often show alterations in phenotype that are either relatively minor or absent altogether. These experiments demonstrate that developmental perturbations such as changes in cell number and arrangement result in new, but nonlethal, skeletal morphologies. This chapter has two objectives. First, to present evidence from limb development supporting Hinchliffe's model of evolvability in distal limb structures. Evolvability refers here to a species' capacity to generate heritable phenotypic variation (Kirschner and Gerhart, 1998). Data from experimental genetics indicate that the mammalian distal limb (autopod) fulfills many of the theoretical criteria for "evolvability," suggesting that the origin and radiation of mammalian clades would be expected to include early and rapid changes in autopod morphology. 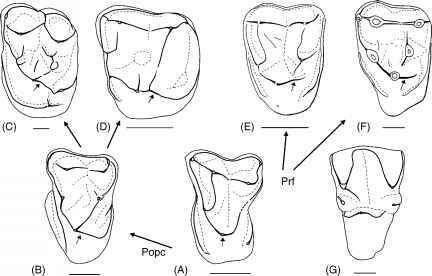 The second objective of this chapter is to present comparative evidence from hindfoot morphology showing that mammalian adaptive radiations frequently involve diversification of digit proportions associated with the evolution of new postural behaviors. These data establish diversification in digit proportions as a repeated pattern in tetrapod evolution, and data are provided documenting the evolution of derived digit proportions in early primates. The fossil evidence for skeletal evolution in early primates and other mammals is therefore consistent with Hinchliffe's (1989, 1991) hypothesis, revealing that the evolution of new digit proportions was a critical first step in the origin and adaptive radiation of the order Primates.